The Lexus LX is a full-sized sport utility vehicle sold by the Lexus division of Toyota. First introduced in 1996 as the LX 450, it was Lexus's first SUV. 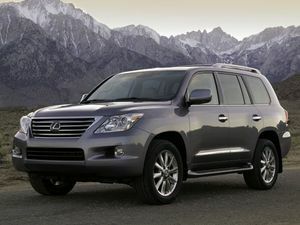 The third-generation Lexus LX 570 debuted at the 2007 New York Auto Show, and is scheduled to replace the current LX 470. As the name suggests, the LX 570 will now feature a 5.7 litre V8 engine, same one as in the current-gen Toyota Tundra, with 381 hp and over 400 lb-ft of torque (the Tundra similarly has 380 hp and 401 lb-ft). The LX continues as Lexus' largest and most luxurious SUV, with a capacity for eight. See Wikicars' comprehensive LX 570 Review. The LX 570 has been completely redesigned for the 2008 model year. Trim levels and body styles have yet to be fully released for the new LX. However, at the New York International Auto Show, key details were provided. The LX 570 will offer: semi-aniline leather seats, four-zone climate control, a 19-speaker Mark Levinson surround sound stereo system with hard drive memory storage, and Lexus Intuitive Park Assist, a sonar parking assist feature. New systems include cameras mounted on the sides of the vehicle's chassis to help the driver view "blind spots", Bubinga wood trim (a form of African rosewood also used in private aircraft and high-quality instruments), a cooler for storage of cold drinks, sliding rear seats, power third row seats, and a 9-inch DVD rear-seat entertainment system. XM Satellite Radio with NavTraffic is standard. According to J.D. Power, the LX has been one of the most reliable SUVs on the road. The LX 570 features 10 airbags, and the Lexus Pre-Collision System is available. Active Front Headrests are featured (also known as Pre-Crash Intelligent Headrests), debuting this Lexus safety feature for the first time on an SUV in the U.S. There are currently no hybrid models of the LX 570 planned or in production. On the LX 570, unique attributes include the blind spot multi-camera system and the exclusive Bubinga wood trim. Kelley Blue Book gave the LX its Best to Hold Value Award in 1998, 1999, and 2000. The exterior styling of the LX generations have attracted differing opinions; some praise the strength and substantial quality they perceive in the design, while others find the LX too conservative in its outward appearance. The next generation LX570 made its debut at the 2007 New York Auto Show. The LX 570 os a complete redesign of the LX, and the first version of Lexus' largest SUV to premiere before its expected Land Cruiser counterpart. The LX 570 features an all-new 3UR-FE engine which is the most powerful engine ever developed by Toyota (and also used in the new Tundra). Total engine output is 381 horsepower and 401 ft.-lbs. of torque. The more powerful engine gives the LX an increased towing capacity of up to 8,500 pounds. The new engine is tied to a six-speed sequential-shift automatic transmission. The Lexus LX470 has a 4.7-liter, four-cam V8 engine with four valves per cylinder. The LX has a welded steel body and a capacity to seat eight passengers. Standard features included a 11-speaker Mark Levinson premium sound system, DVD-based navigation system, Bluetooth connectivity, and backup camera. A rear seat DVD entertainment system was available. The LX 470 was the only Lexus SUV to offer Lexus Night Vision, an infrared camera safety system, as an option. The night vision technology projected enhanced images on the windshield, enhancing forward visibility during dark or nighttime conditions (the infrared camera picked up light from objects beyond the range of the low-beam headlights). The LX470 shares the same floorplan and most body panels with the Toyota Land Cruiser. The current LX470 differs from the Land Cruiser only in its front optics and a more luxurious interior. 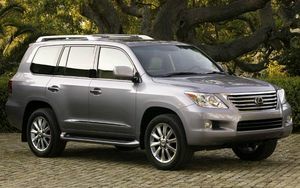 Despite the fact that the LX470 is one of the most expensive SUVs, Toyota said it would halt production of the Lexus LX for 2006 due to slow sales. A completely redesigned LX 570 is scheduled to premiere at the New York International Auto Show in 2007. 2006 Upgrades This time the LX470 got an added 45 hp boosting the total to 275 hp (was 230 hp). The engine provided VVT-i (variable valve timing). The car also got LED rear tail lamps, new grille and redesigned wheel spokes. 2003 Upgrades For the 2003 model year, the Lexus LX470 got a interior refesh, new grille, redesigned wheel rims, and a 5 speed gear gox (last one was 4 speed). The original LX 450 design. The LX 450 was released in 1996 as Lexus' first entry into the SUV market. Unlike other Lexus efforts which were independently or divergently developed from Toyota vehicles, the LX 450 was almost entirely based on the sixth generation 80 series Toyota Land Cruiser. The LX 450 was brought to market as a rebadged model during the U.S.-Japan trade war of the mid-1990's. 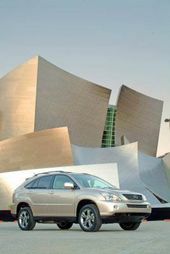 At the time, the U.S. government threatened to place 100% tariffs on all Japanese luxury import cars; by producing a luxury SUV, Lexus would have a model exempt from the tax. Ultimately however, a gentlemen's agreement was reached and the threatened tariffs did not materialize. Differences between the LX 450 and the Land Cruiser lay in a restyled, more luxurious interior and softer suspension settings. The LX 450 was targeted against luxury SUV competitors such as Land Rover/Range Rover. The LX 450 was powered by a 4.5 liter, twin-cam, four-valve inline-6 engine which produced 212 horsepower and 275 ft. lbs. of torque. Onboard amenities included leather seats and seating capacity for up to seven passengers. The three available options consisted of a console-mounted 6-disc CD changer, front and rear differentials, and a power moonroof. At the time of its 1996 debut, the LX 450 was listed with a manufacturer's suggested base price of $47,995. The LX 450 sold over 5,000 units in 1996 and over 9,000 units in 1997. The LX replaced the Toyota Land Cruiser in the Canadian market starting in 1996, reducing internal competition (big expensive SUVs have traditionally faced a difficult market in Canada) and avoiding the issue of selling a rebadged model (except for GM, Ford and Chrysler, rebadged models in Canada have not met with success). For a 5,000 lb. vehicle, the LX 450 was regarded by some critics as underpowered, leading to the shortening of its model cycle (despite sales increases) and replacement with a V8-powered successor. In addition to North America, the Lexus LX is sold in Australia and the Middle East. The second generation LX was the only Lexus SUV to feature quadruple headlights. The Lexus LX was named by J.D. Power and Associates as the best luxury SUV in initial quality in 2000, 2002, and 2004. In 2005, J.D. Power named the LX 470 the most reliable luxury SUV over a three year period in its Vehicle Dependability Study. The LX 450 was the top-ranked full-size sport utility vehicle in J.D. Power and Associates' Initial Quality Survey, with the lowest number of problems experienced by new owners during the first three months of ownership. This page uses content from Wikipedia; see Lexus LX, which includes these contributors. This page was last edited on 18 October 2010, at 14:16.